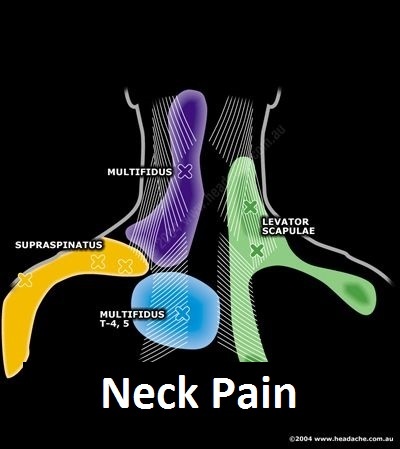 Upper neck problems are a common cause of referred pain into the head region. Research has demonstrated how the nerves in the upper neck (when irritated), can send pain signals into the head and face regions; researchers believe this happens because the nerves supplying the skin and other sensitive structures in the neck have connections with the nerves supplying the face, forehead, temples, and even behind the eyes. Often these people report a slow worsening of the intensity, and frequency of their headaches, and sometimes they may start to have migraines as well. In short, neck problems are a common source of irritation for headache and migraine sufferers; even where other problems may be the obvious initiators of attacks (ie: menstrual migraines).The various components of these types of headaches can be readily addressed through treatment. Chiropractors, Osteopaths and manipulative Physiotherapists are well trained to diagnose and manage such problems. It is also important to note that many headaches and migraines have a number of ‘ingredients’ which combine to produce head pain. For further information please see the rollover sections on the homepage head illustration to see specific problems in specific parts of the head, neck and face. Note that headaches can also be secondary to more serious problems such as infections and malignant conditions and it is important for the sufferer of any persistent headache(s) to consult with a health care professional and get the problem properly diagnosed. Balwyn. VIC. 3103. Melbourne. Australia.